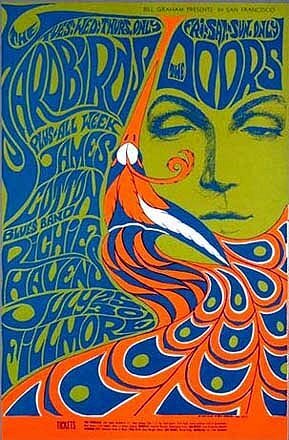 Art, design, music, fashion and culture got exciting during the sixties. The first half of the decade saw an explosion of young artists and musicians making setting the scene with rock’n’roll, mini skirts, youth targeted music shows and pop art. The second half of the decade saw these teens grow up. A drug culture had started at first in California but soon widely spread. Attempts to replicate and enhance the mind-altering experiences of psychedelic drugs were done through art, design and music. More relaxed shapes and swirly mind bending prints were very popular at the time. Here are two nehru jackets worn by Sonny and Cher. Influences from non-Western cultures were a big part of the psychadelic era, as seen here in the prints. Psychedelia hit its peak when the Beatles incorporated into their work, especially heard in their song ‘Lucy In The Sky With Diamonds’. 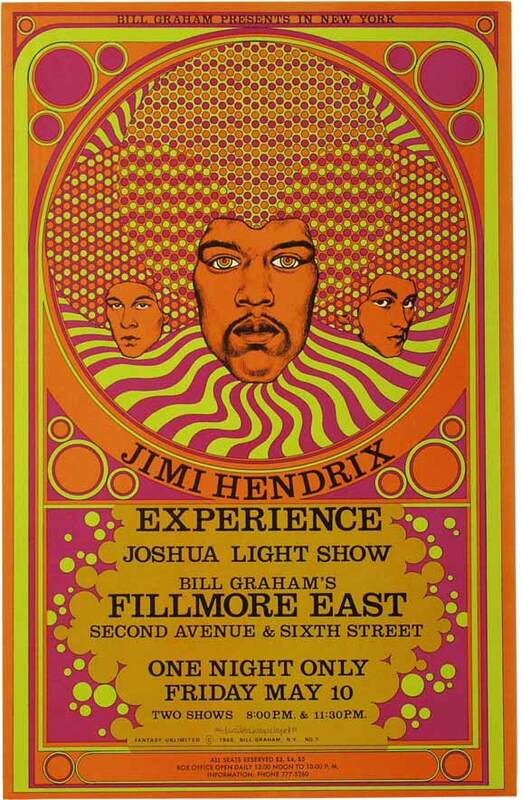 Fillmore posters, which originated at the time were named after the venue which played host to The Doors, The Jimi Hendrix Experience, The Grateful Dead and a lot more. Mesmorising prints, groovy liquid lettering and bright colours were designed for every show and handed out to everyone as they left. The venue was known for it’s lighting shows and legendary ambience. The influences can be seen in these prints too, the lower one very much representing the free love of the era.